Toyota says it can fix pedal problem. MUNICH – Toyota Motor Europe said the first parts to fix accelerator pedals of up to 1.8 million cars it plans to recall in Europe will arrive next week. 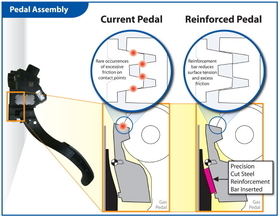 Toyota said its engineers have developed and rigorously tested a solution that involves reinforcing the pedal assembly to eliminate the potential risk of excess friction that could cause the pedal to stick. The company said it is not aware of any accidents in Europe where an accelerator pedal sticks in a partial open throttle position or returns slowly to the idle position. 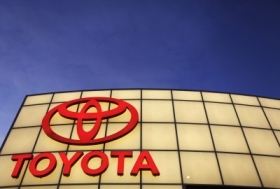 European customers affected by the recall are being contacted and Toyota said it has already implemented an effective production solution for vehicles to be sold in Europe. Toyota Motor Europe CEO Tadashi Arashima said: "We know what the problem is and how to fix it, so now our focus is to make that fix as quickly as possible." Toyota said on Jan. 29 that it would recall eight of its top-selling models in Europe to fix a problem with the cars' accelerator pedals. Toyota said the problem involves a friction device in the pedal designed to provide the proper "feel" by adding resistance and making the pedal steady and stable. The device includes a shoe that rubs against an adjoining surface during normal pedal operation. These surfaces may, over time, begin to stick and release instead of operating smoothly due to the materials used, wear and environmental conditions. In some cases, friction could increase to a point that the pedal is slow to return to the idle position or, in rare cases, the pedal sticks, leaving the throttle partially open. Toyota will install a steel reinforcement bar to pedals that could stick. Toyota's fix involves installing a steel reinforcement bar into the friction device to reduce the surface tension between the friction shoe and the adjoining surface. “With this reinforcement in place, the excess friction that can cause the pedal to stick is eliminated,” Toyota said. The carmaker said it has confirmed the effectiveness of the newly reinforced pedals through rigorous testing on pedal assemblies that had previously shown some tendency to stick.